Wasps are one of the most intimidating and notoriously ferocious stinging insects around. When they gather in numbers, as they do to protect their hive, they can be deadly. While it is true that wasps should not be killed wantonly, there are times when convenience or the safety of your family takes absolute precedence. At such times, knowing how to effectively deal with a wasp swarm and dispose of the nest carefully is an essential part of home care. 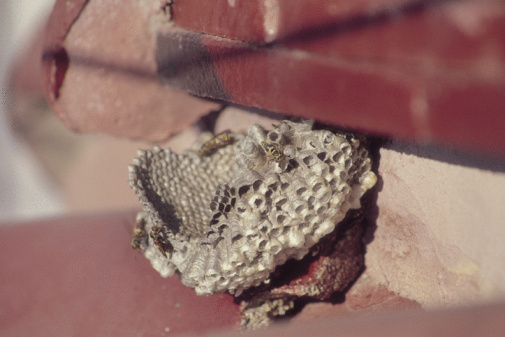 Wasp nests can lurk in secret places. Protect yourself. The safety of you and any bystanders should be your first priority before attempting to deal with large numbers of stinging insects. Wear several layers of pants and shirts, and ensure that all areas of skin are covered. Cover your face with a scarf or netting if available. Wear gloves and perhaps even a plastic coat. Purchase or make your own wasp-killing spray. You can make your own spray by mixing dish soap (4 to 5 tablespoons should do it) into water. The resulting solution can be put in a spray bottle, a high-pressure water gun or can be attached in a canister to the underside of a garden hose. 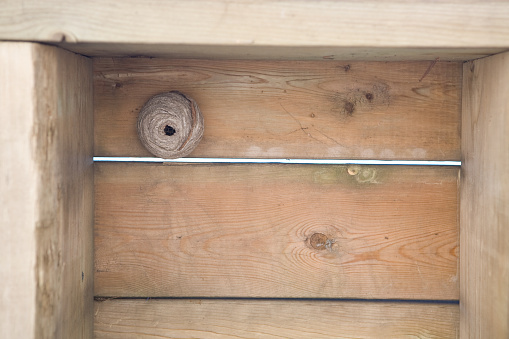 Spray the wasps' nest, soaking it completely in as short a period of time as possible. Watch for wasps to return to the nest and spray them as well. Wait 20-30 minutes for the wasps to die. Repeat Step 3 if necessary. Knock down the nest using a long-handled stick, a shovel or a broom. Put the nest into a garbage bag and seal the bag tightly. Dispose of the bag in the normal manner.